The Space Manufacturing Facility Concept. Gerard K. O’Neill, Princeton University. Transport of Lunar Material to the Sites of the Colonies. Thomas A. Heppenheimer, California Institute of Technology. Lunar Materials. David R. Criswell, Lunar Science Institute. Deep Space Material Sources. K. Eric Drexler, Massachusetts Institute of Technology. Baseline L5 Construction Station. Gerald W. Driggers, Southern Research Institute. Earth-to-Orbit Transportation for Advanced Space Facilities. Hubert P. Davis, Johnson Space Center, NASA. Advanced Earth-to-Orbit Transportation for Large Space Facilities. Robert Salkeld, System Development Corporation. Laser Propulsion to Earth Orbit. Arthur R. Kantrowitz, AVCO Everett Research Laboratory. Near-Term Chemically-Propelled Space Transport Systems. Adelbert O. Tischler. Process Chemistry for L5. Philomena Grodzka, Lockheed Missiles & Space Company. Industrial Development in Zero-G. Louis R. McCreight, General Electric Company. Production, Assembly, and High Vacuum Fabrication. C. Mel Adams, University of Cincinnati. Closed Ecosystems of High Agricultural Yield. H.K. Henson and C.M. Henson, Analog Precision, Inc.
Development of the Satellite Solar Power Station. Peter E. Glaser, Arthur D. Little, Inc.
Closed Brayton Cycle Turbines for Satellite Solar Power Stations. Gordon R. Woodcock, The Boeing Company. Some Physiological Effects on Alternation between Zero Gravity and One Gravity. Ashton Graybiel, Naval Aerospace Medical Research Laboratory at Pensacola. Meteoroid and Cosmic-Ray Protection. Eric C. Hannah, Princeton University. Diversity, Survival Value, and Enrichment: Design Principles for Extraterrestrial Communities. Magoroh Maruyama, Portland State University. Architectural Studies for a Space Habitat. Ludwig Glaeser, Museum of Modern Art. New Options for Self-Government in Space Habitats. Richard Falk, Princeton University. Organizational Possibilities for Space Habitat Realization. Konrad Dannenberg, University of Tennessee. International Law and Outer Space Stations. Edward R. Finch, Finch and Schaefler. The INTELSAT Arrangements. Gus J. Rauschenbach, COMSAT Corporation. Summary of Problems of Greatest Urgency. Robert F. Freitag, NASA Headquarters. Developing Space Occupancy: Perspectives of NASA Future Space Program Planning. Jesco von Puttkamer, NASA Headquarters. Data Collecting Activities of the “Outlook for Space” Panel. William G. Stroud, NASA Goddard Space Center. Planning for the 1975 NASA-Ames/Stanford University Summer Study. William L. Verplank, Stanford University. 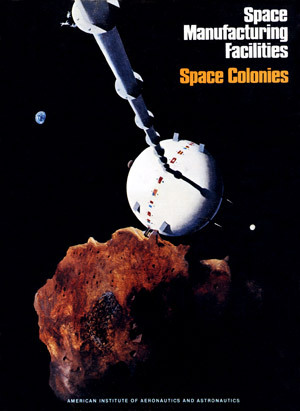 The Colonization of Space. Gerard K. O’Neill, Princeton University. Some Social Implications of Space Colonization. Gerald Feinberg, Princeton University. More Distant Possibilities for Space Transportation Systems. George Hazelrigg, Princeton University. Living and Working in Space. Joseph Allen, NASA Johnson Space Center. Space Colony Transportation. Robert Wilson, NASA. Materials Available from the Surface of the Moon. David Anderson, Columbia University. Systems for the Production of Aluminum, Glass and Oxygen from Lunar Materials. K. Eric Drexler, Massachusetts Institute of Technology. Space Colony Supply from Asteroidal Materials. K. Eric Drexler, Massachusetts Institute of Technology. Costs of Transporting Materials from Earth to L5. Eric Hannah, Princeton University. Summarization of Conference: The Colonization of Space. Gerard K. O’Neill, Princeton University.